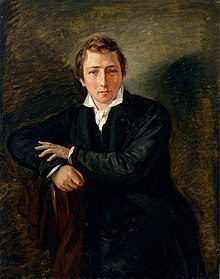 Christian Johann Heinrich Heine (German: [ˈhaɪnʁɪç ˈhaɪnə]; 13 December 1797 – 17 February 1856) was a German-Jewish poet, journalist, essayist, and literary critic. He is best known outside of Germany for his early lyric poetry, which was set to music in the form of Lieder (art songs) by composers such as Robert Schumann and Franz Schubert. Heine's later verse and prose are distinguished by their satirical wit and irony. He is considered part of the Young Germany movement. His radical political views led to many of his works being banned by German authorities—which, however, only added to his fame.